While many of the bus charters we book are short trips, there are some that can last for several hours or even multiple days. 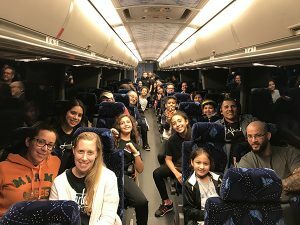 Sports teams traveling to out of state tournaments, vacation trips to faraway locations, and one-way or round-trip travel to cities hundreds of miles away are only a few examples of the long trips we sometimes make. If you are in for the long haul, it’s a good idea to plan accordingly. Traveling for several hours or multiple days on a bus can easily become uncomfortable, no matter how luxurious the charter bus is. When packing for an extended bus charter, there are four essential things to plan for: Eating, sleeping, freshening up, and playing. Depending on how often your luxury bus charter stops, you may need to keep yourself fed and hydrated. Avoid packing foods that can spoil or are messy. Strong smelling food may bother your trip mates. Instead, bring things like bottled water, juice boxes, granola or breakfast bars, raw vegetables and string cheese. Make sure to have napkins or hand wipes as well. Sleeping on a bus can be more comfortable if you pack earplugs, a light-blocking eye mask, and a pillow. You may also want to bring a light blanket or at least a sweater or hoodie that can double as a cover. Remaining fresh on a luxury tour bus requires packing things like deodorant, hand sanitizer, lip balm, contact lens solution, tissues, your medication, feminine products, and travel-sized toothpaste and toothbrush. It’s a good idea to bring a spare pair of socks as well. Your trip will go by faster if you keep yourself occupied with books, magazines, or other reading material. Bring a tablet or laptop to watch your favorite movies or TV shows or to play video games. Long distance trips require plenty of advanced planning. But when you pack properly, it can make the trip shorter, smoother, and more enjoyable.